It’s easy to appreciate the need to disinfect germs on surfaces, but have you ever wondered how germs exist on surfaces in the first place? Enter the biofilm. In recent years, scientists have increased their understanding of these dense colonies of bacteria that produce an extracellular material that binds a community of different microorganisms together and anchors them to both living and inanimate surfaces. 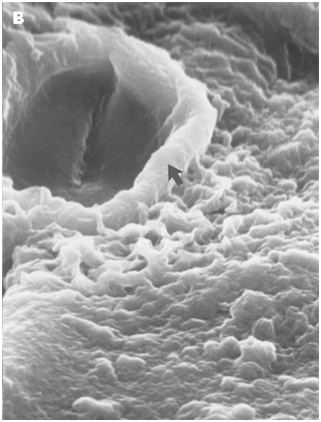 Scanning electron microscopy of a medical shunt showing complete colonization of the surface by a biofilm. Biofilms form in virtually every imaginable environment on Earth; they can be harmful or beneficial to humans. In fact, the human body has biofilms in the mouth and intestinal track that can protect our health or harm it. Dental plaque is a common example of a biofilm that forms on tooth surfaces. The products of metabolism of the bacteria in plaque are responsible for tooth decay and gum disease. Biofilms can harbor human infectious agents in the environment, but they also can promote remediation of contaminated groundwater and soils. They assist in metals mining and they play an important natural role recycling matter on Earth. Hence, understanding “the good and the bad” characteristics of biofilms under diverse conditions is of great interest. A 1996 review article in the journal Science reported on an important shift in understanding in microbiology: that bacteria, instead of floating freely, commonly aggregate as clumps surrounded by slime and stuck to surfaces. If not disrupted, these biofilms thrive under the right conditions. Before the latter third of the 20th century, microbiologists focused on free-floating bacteria grown in laboratory cultures; they now understand that 99 percent of all microbial activity in an open ecosystem is in biofilms. In these microbial communities bacteria are bound together in a sticky web of polysaccharide fibers secreted by bacteria that connect and protect cells. Water and nutrients circulate and waste products are removed through open channels that operate similarly to a living being’s circulatory system. The biofilm operates more like a multicellular organism than a collection of organisms, increasing the odds of survival among “community” members. Bacterial colonies even communicate among themselves by a primitive system of chemical signals. Biofilm formation is a critical issue for almost all surfaces in health care and food preparation settings. Biofilms can grow on medical implants, creating the opportunity for infections to flourish and even facilitate human deaths, for these tough microbial communities can resist antibiotics and evade the immune system. Biofilms on food-contact surfaces in restaurant, institutional and home kitchens afford foodborne pathogens such as as E. coli and Salmonella the opportunity to survive. Thus, cleaning and disinfecting key surfaces to prevent or remove biofilms helps to prevent the spread of institutional infections and foodborne illness. Biofilms eventually develop on the interiors of most water distribution systems. Known as “biofouling,” the microbial growth represents a contamination that may present a threat to public health. As noted above, biofilms can harbor human pathogens that are difficult to kill. Chlorinating the water supply is the usual method employed to control biofilm growth. Superchlorination, in which chlorine levels are raised temporarily, may be combined with mechanical flushing and scouring, and used when biofilm causes water quality problems. Although water treatment operators fight a constant battle against biofilms, these bacterial communities can also be used to improve water quality. Sand filters, for example, use biofilms beneficially. As raw water trickles through sand grains, bacteria that feed on organic material in the water attach to the grains, setting up biofilm colonies. The constant stream of nutrients “feeds” the biofilms, clearing the water of the undesired organic matter. Biofilm-treated water requires less disinfectant and forms fewer disinfection byproducts. Scientists will continue to probe the good and the bad of biofilms: how these micro communities live, interact and die, in order to promote beneficial uses and control the harmful impacts. Stay tuned for the next exciting, exacerbating and enlightening developments on biofilms. 1Biofilms may include protozoa, which are single-celled microorganisms that are major consumers of bacteria.